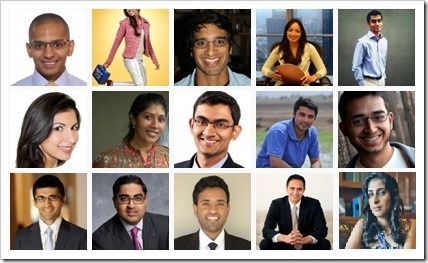 23 Indians feature in Forbes “Brightest Young Stars” List: 30 Under 30! The world is noticing us and our achievements; they are in awe of our expertise in different streams and fields and they can no longer ignore us. In the annual Forbes “Brightest Young Stars” list: 30 Under 30, there are staggering 23 Indians who have been mentioned due to their fascinating work in different streams. This prestigious 30 under 30 list include some of the most accomplished personalities from 15 different fields including finance, media, sports, entertainment and education and more. This year’s list include some of the biggest names such as Justin Bieber, Miley Cyrus and Taylor Swift, founder of Tumblr David Karp, Pakistani girls’ rights activist Malala Yousafzai, tennis player Maria Sharapova among others. As per Forbes, “This is an exhilarating time to be young and ambitious. Never before has youth been such an advantage. These founders and funders, brand builders and do-gooders aren’t waiting around for a proper career bump up the establishment ladder. – Karan Chopra, 29, who cofounded, GADCO, which is Ghana’s largest producer of rice. – Ganesh Betanabhatla, 28, who is the Managing director at investment firm Talara Capital. – Megha Parekh, 28, who is Vice president at American football team Jacksonville Jaguars. – Divya Nag, 22, who is a leading name having cofounded, Stem Cell Theranostics and StartX Med. – Raghu Chivukula, 29, who is Resident Physician at the Massachusetts General Hospital. – Surbhi Sarna, 28, who was inspired to found nVision Medical when at age 13! – Sam Chaudhary, 27, who cofounded ClassDojo, a software company that helps teachers track classroom behavior. – Eesha Khare, 18, who won the Young Scientist Award at the 2013 Intel International Science and Engineering Fair. – Aditi Malhotra, 28, is the founder of Tache Artisan Chocolate boutique. The complete coverage and list has been published in the current month’s issue of Forbes magazine, and can be accessed here.